It's amazing what you can find on the internet. All I was looking for was a different way to serve squash. I believe I found a culinary diamond. This dish is wonderful candied squash, topped with minty-garlicky yogurt sauce and then beautifully Middle Eastern spiced meat. This is a recipe for Afghani Kaddo Bournai, or perhaps I should say a recipe for Kaddo Bourani from an Afghani restaurant. There is a difference. chunkier than ground beef. It add a nice texture. It all started from a Google search for "unusual squash recipes". I had half a squash left over in the refrigerator. What came up was the same recipe over and over and over. It sounded really good, and from post to post the recipe was almost cut and paste identical. It seems to have originated at a restaurant called The Helmand, with locations in San Francisco and Baltimore, USA. In a couple posts some bloggers helpfully tried to give an alternate name, Kadu bouranee. According to Wikipedia, Kadu bouranee is a pumpkin dish made by frying pumpkin with different spices. It is topped with sour cream and dried mint. That's not this Kaddo Bourani. 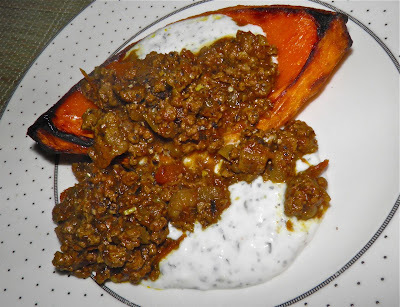 First, in Kaddo Bourani the pumpkin (in my case squash) is baked with sugar to sort of candy it (just a little); the sour cream sauce is yogurt, mint and garlic; and there is a delicious simmered meat sauce. That isn’t present in Kadu bouranee at all. I have adjusted the amounts to reflect what I think will feed four people. What I prepared was nowhere near enough for two people. We could have eaten double the amount. My spouse said this was the best way he ever had squash. High praise. For my part, I enjoyed it thoroughly. I have a physical reaction to food that I find well above par. I get kind of a slight body shiver. I got shivers over this one. Plural. Shivers. Of course, I have altered the recipe somewhat from the original, but the heart of it remains intact. If you like squash and want to try something a little different make this. In fact, make a point of serving it this weekend. It's relatively inexpensive, too. Even before it hits your plate you're treated to the wonderful exotic aromas of the spices in your kitchen. Cumin must be one of my favourite scents. You've not experienced heaven on earth until you've tasted baked squash with garlic-mint yogurt and meat sauce. Seriously. One last note: the recipe calls for a sugar pumpkin. This is not a jack o' lantern pumpkin. It's the small cooking pumpkin. You can also substitute your favourite winter squash variety. Pumpkin and squash are both "squash," after all. This is the sauce just as it starts to simmer for 1/2 hour. break down to make a wonderful, slight sauce. Clean the sugar pumpkin (or squash) of seeds and cut into four quarters. Remove the skin from the squash. Place the squash in a baking dish, rub with the oil and sprinkle each piece with 1/2 tablespoon of sugar. Place in the oven and bake for 1 hour. While the squash is baking mix the yogurt, the 5 garlic cloves, mint and salt together in a bowl. Let the flavours mingle on the counter while the squash finishes cooking. Make the meat sauce by heating the oil in a large sauté pan. Add the onion and sauté. 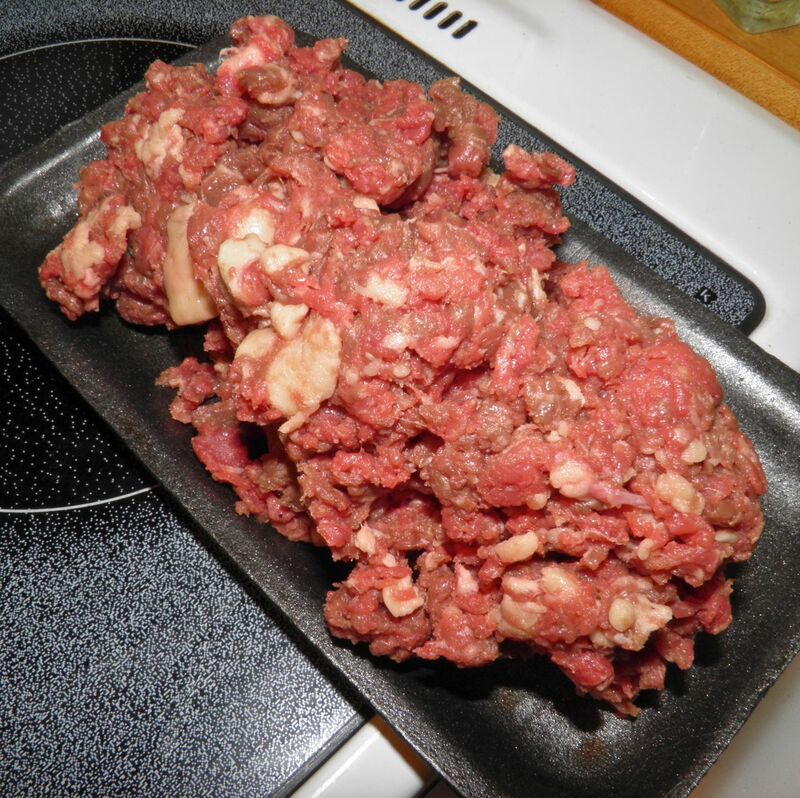 Prepare the beef (or use ground beef). 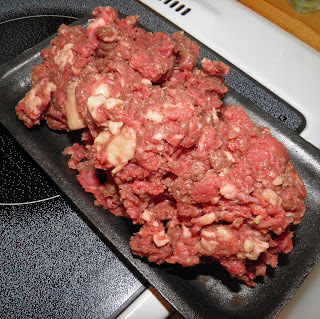 I chopped my beef in a food processor so it had a rougher consistency than ground beef. It added a more "country" touch. Let the onions cook in the pan until they begin to brown, about 5-6 minutes. Then add the garlic and cook for a further minute. Add the beef and cook until no longer pink. 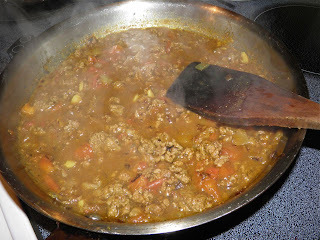 Add the remaining ingredients, bring to a boil and then reduce the heat to simmer. Let the mixture cook until he squash finishes cooking, about 30 minutes. The mixture will be almost dry and the tomatoes will break up. To serve, place a squash quarter on a plate. Add a river of yogurt sauce and then top with meat sauce.